Before I watched it this weekend, Guddi was known to me only as a celebrity clown-car film - which was more than enough to make me want to watch it, especially in anticipation of this week's release of the celebrity clown-car film du jour. So imagine my surprise when I discovered that the showers of stars was by no means the movie's finest moments. Those are all courtesy of Jaya Badhuri, only twenty-three and most decidedly the best thing since sliced bread. Her expressive face, glowing smile, twinkling eyes, and natural movements and stillnesses are completely impressive. She has a wonderful part to work with, and she makes the most of it in a performance that is somehow both wise and fresh. She comes off as genuine, as though she simply is Kusum and the movie happens to capture her unselfconsciously existing in her own life. She makes Kusum someone we all know. Either way, I was sad to see Kusum behave much differently on the film sets than she did at home - she's quiet and subdued, and she doesn't express any wide-eyed joy in witnessing her favorite hobby first-hand. I realize that the magic of the movies is supposed to fade in the face of the real-life toil she and Professor Gupta observe, thus teaching her that her dreamy world is fake-pretend and that she best figure out what is truly real in her life and engage with it (a good lesson for those of us who seem to enjoy fake-pretend a little too much, I duly note). But her transition was too quick to be consistent with the character we knew before she came to Mumbai. I must discuss a segment of the movie that I found incredibly effective and clever and that I am surprised not to have heard about before. When Kusum visits Mumbai, we see her looking out the window of a car at all the movie hoardings, and a song (which isn't listed in the song menu on my DVD - I read in Rediff that the movie incorporated older songs, so I assume it's one of those) and snippets of dialogue are woven with shots of or pans across different advertisements. 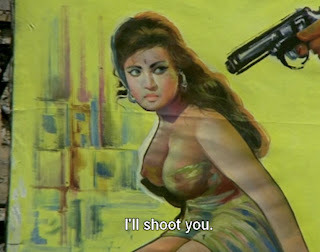 "Pyaar, pyaar" accompanies embracing couples, a leering face appears with a cackle of laughter, a fight dishoom-dishooms, and as a gun threatens a scantily-clad woman** a shot rings out and we flash to a bleeding corpse. It'd make a good introduction to some standard masala plot elements - it's almost a complete mini-movie by itself. It's a fitting tribute to the talents of sign painters, whose dramatic, vibrant images are given even more life as moving footage animates them in clever composition with music and words. The whole thing is fantastic. Here's a slide show (if I could figure out how to get the show to pan across each still, you'd get a better idea of the effect in the song) (and I can't find the scene online, sadly). Overall I found the movie utterly delightful whenever Jaya was on screen. Other aspects - a motherless family, a wacky scheme to teach someone a lesson, the story of a girl growing up and maybe having to calm down a bit in the process (I'm not sure if Hrishida was saying that - but I think it's possible to see the story that way) - were pleasant enough but didn't really grab me. No matter - Jaya is more than enough reason to watch Guddi and be completely charmed and entertained. I would love to see her in other roles and welcome suggestions on what to watch (I've only seen her as suffering KJo mothers, Sholay, and Chupke Chupke). *There's also an unintentionally humorous side effect of having a real person comment on his work and be described in certain terms: our twenty-twenty hindsight lets us note that the persona now is not quite the same as the persona used when the film was made. When someone states with resignation that Dharmendra is married, it's hard not to snort "Don't worry, Kusum! Maybe he'll be polygamous for you, too!" When he stands in the ruins of a film studio where he used to work and waxes philosophical about the fleeting nature of his art, I couldn't help but note that he's had three movies out this year. ** I think this is the most naked woman I have ever seen in a Hindi film. She's a still, but still. 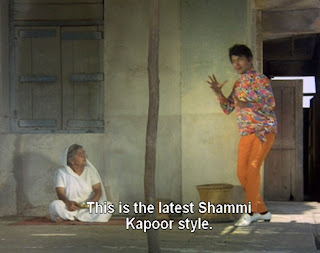 Although Jaya was at her most charming in Guddi, if you want to see more of her you could try Mili (where she plays a full-of-life teenager as well), Koshish (fiery deaf-mute), or Abhimaan (talented singer who outshines her popstar husband, played by Amitabh, who was a lesser star than her at the time) or Bawarchi (by the same director as Guddi, I think). Thanks Nora! Those all sound great! Don't know why noone mentions Jaya in Bawarchi, another partly lively role before she turned to statue forever, it's yet another Mukherjee-film - and a much better one than Guddi.